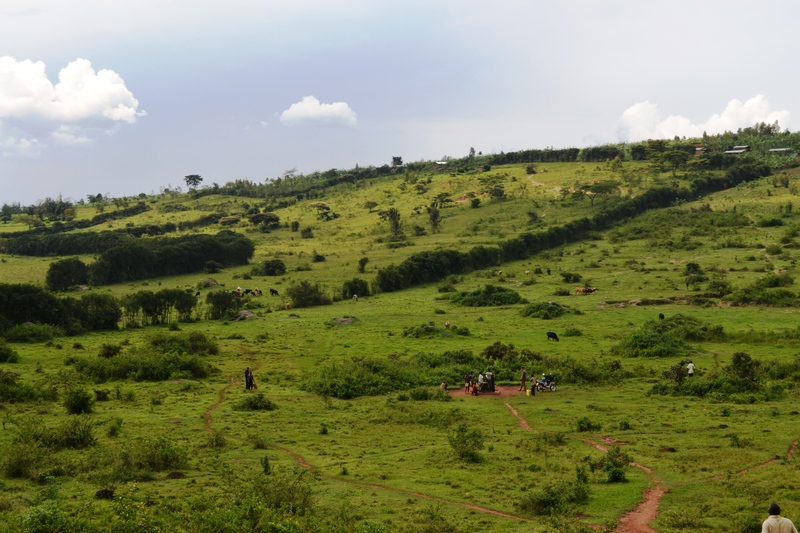 First Gold Standard credits issued in Rwanda! 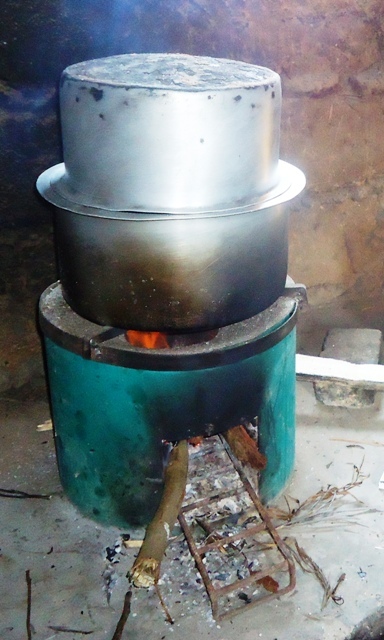 Today we had our first issuance of Gold standard credits from our improved cook stove project in Rwanda! This is the first issuance ever in the country and is a big achievement for CO2balance indicating that the company has the skills, the knowledge and the experience to develop carbon offset projects in different countries worldwide. 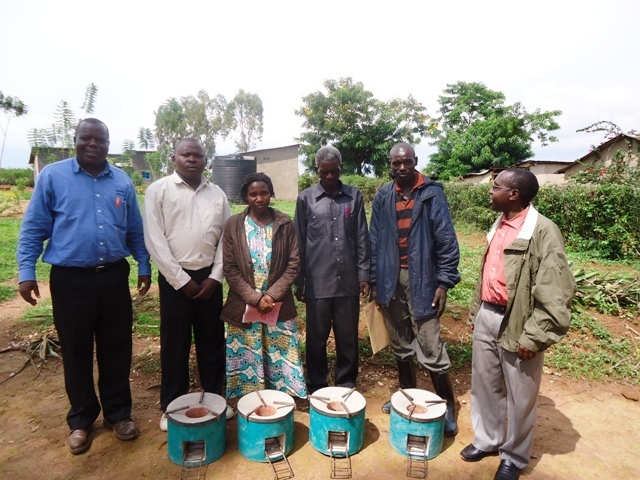 The Micro-Scale improved cook stoves project in Bugesera district has 6515 tonnes of CO2 emissions reductions and generated 6515 Gold Standard carbon credits. 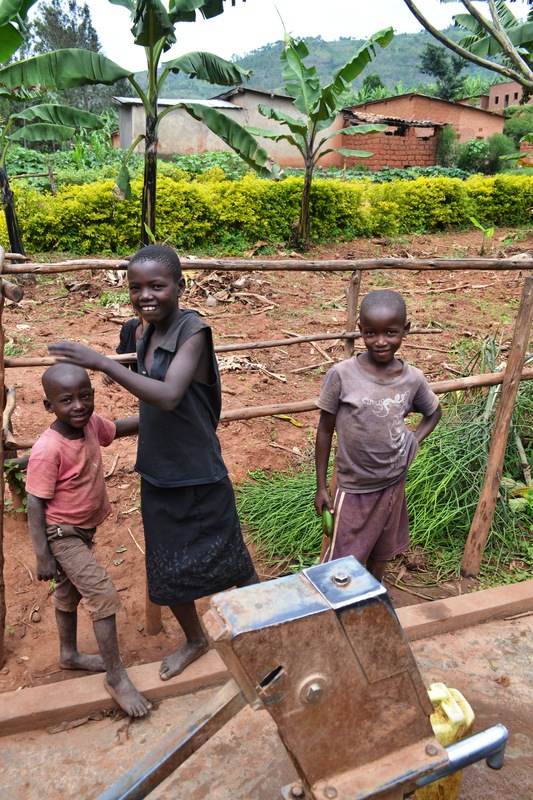 It worth mentioning that the project involved the distribution of approximately 1,683 domestic fuel-efficient cook stoves to households within the Bugesera District in the Eastern Province, Rwanda. The efficient cook stoves are based on a design developed by CO2balance. In addition to reducing the usage of biomass, and thus reducing greenhouse gas emissions, the distribution of fuel-efficient cook stoves also has lessen the amount of harmful smoke and indoor air pollution currently associated with traditional three-stone fires. This will result in a decrease in the incidences of negative health impacts, such as respiratory diseases, amongst rural households. This is a great way to close 2014 for CO2balance. Wish to everybody Merry Christmas and a successful 2015. 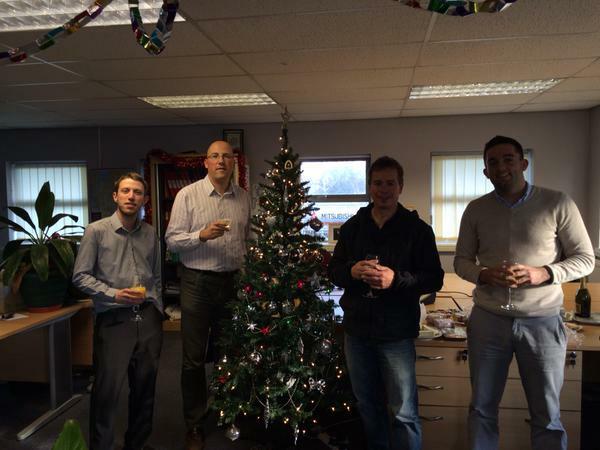 Whatever and wherever you’re celebrating this year, our warmest wishes and friendly greetings this Christmas from us all at CO2balance. Thank you for all your support throughout the year. We hope you get a restful and enjoyable break and we look forward to hearing from you all in the New Year. Often we get to see the stories of project success after projects have been implemented in communities. When in the field, we only spend a few minutes or hours with individuals and get to see how the projects we develop are impacting their lives. We often get to see only small details that inspire the progress we propone. 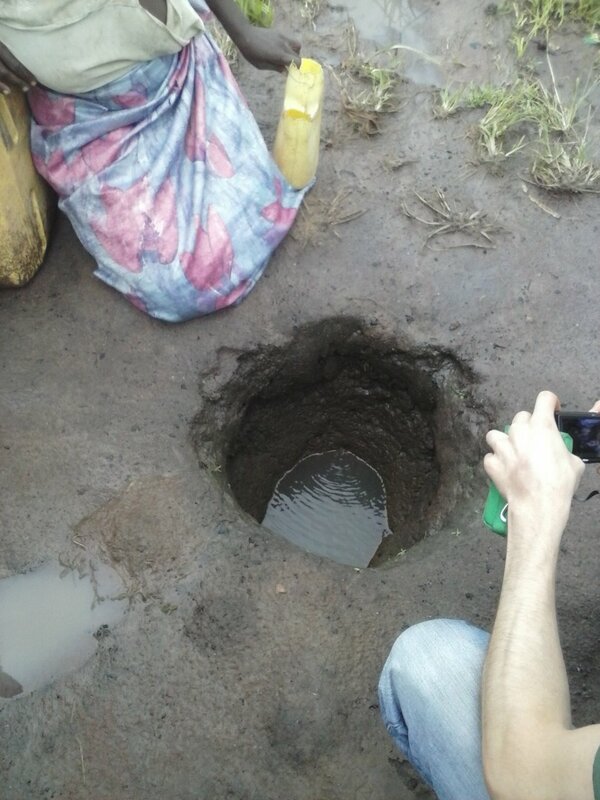 Recently on a field visit to our borehole project in Kaliro, it was seemingly one of those journeys. 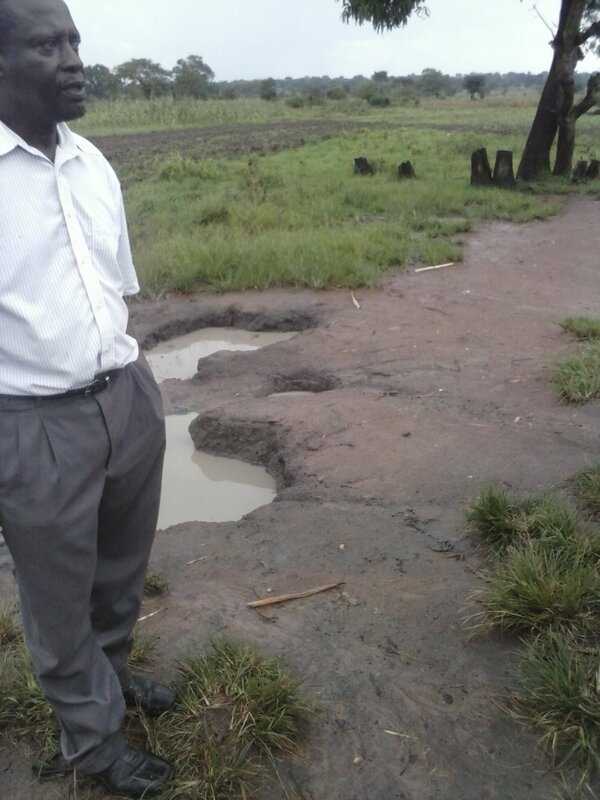 On a rainy Tuesday afternoon when we arrived at one of our proposed borehole repair sites. On arrival this is what we saw. Noah at the water source. We found a collection of sinkholes in the valley that had been washed over by the just completed rain and so we got into a pleasantly animated discussion that is common among the people of this region. 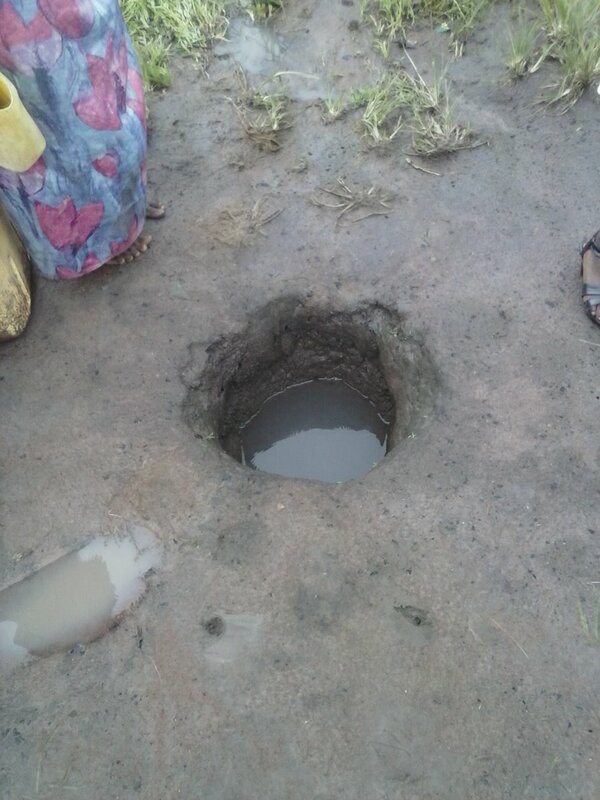 At this point one of the community members took to explaining how they get their water. She showed us a process that shows how much effort they put into getting this water. From a hole full of water she would empty it completely and let water seep in from the ground. 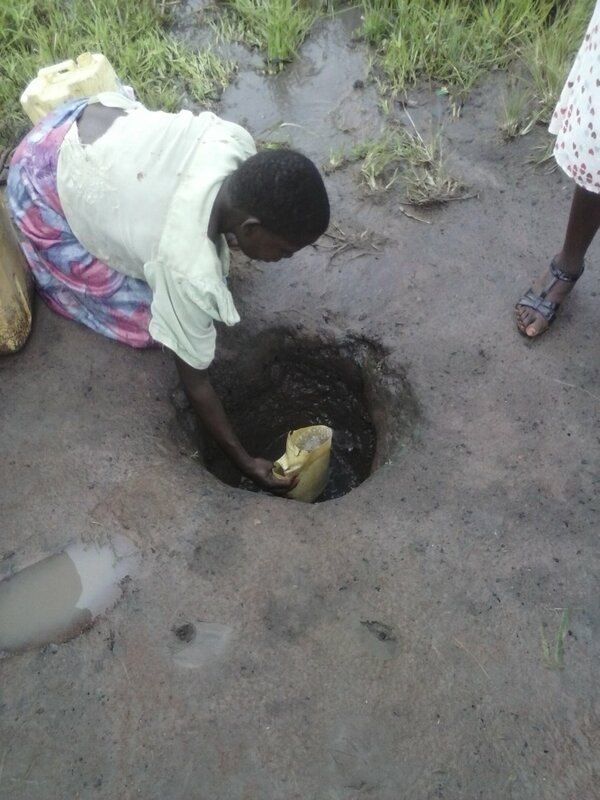 This process would be continued until she considered the water clean enough to pour into her water container. Though clean-ish looking, the water is exposed to so many contaminants it ca.t be considered a safe water source. 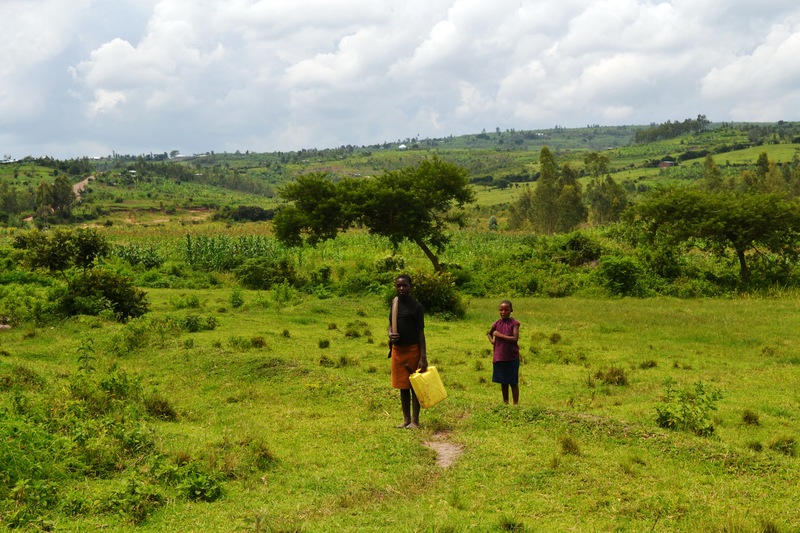 This community will be one of the next ten to be serviced by our second borehole project in Kaliro district. They will be trained in WASH to ensure they observe good sanitation and their new water source will be tested frequently to ensure it is safe for them to consume. Next year will be a good one for the people of Kaliro. 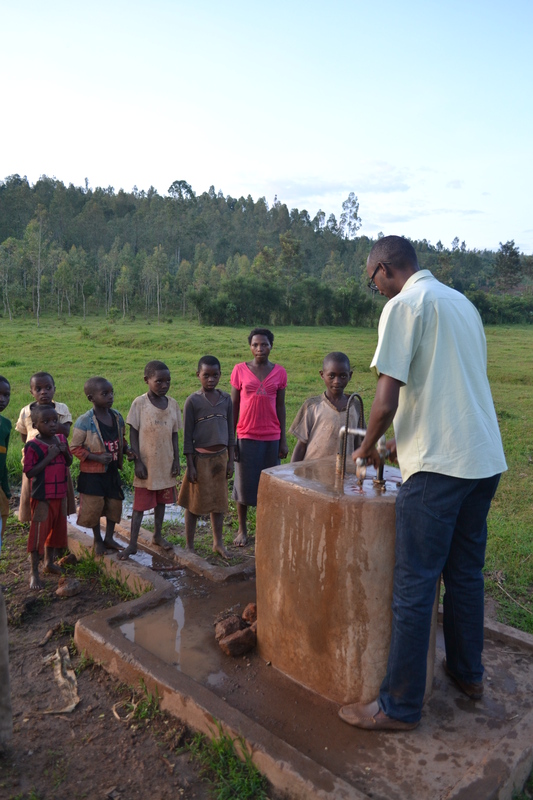 I am very happy to write about the progress of our borehole project in Rwanda. During last week we visited the rehabilitated boreholes in Gatsibo district and met with the communities who have now access to clean water supply. We have discussed the achievements so far and the scope of further improvement with our local NGO partner, Rwandans4Water. 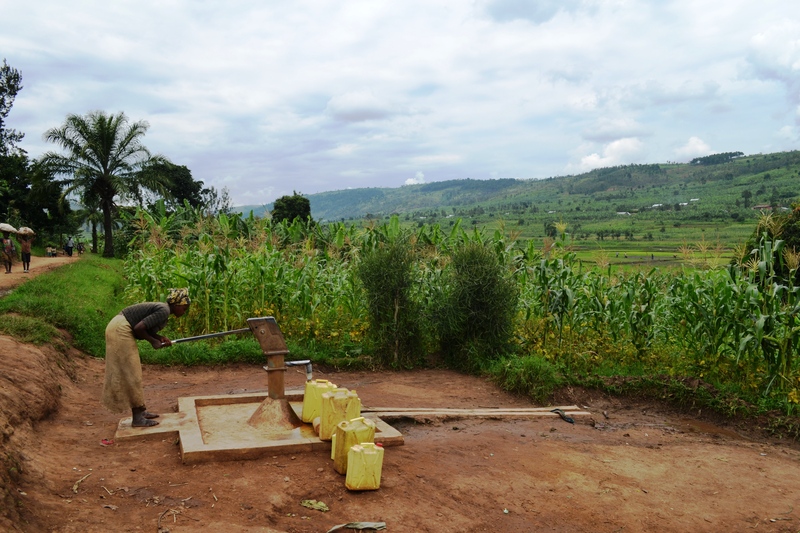 We look forward to starting the new year with even more borehole rehabilitation, this way reaching out to more communities in the Eastern Province in Rwanda. Until then, please some some photos from the last trip below! Every morning and evening, millions of women in Kenya spend time cooking for the families. Most of the families prepare their meals over a smoky, 3-stone open fire. The stoves burn a mix of wood, hay, or cow dung that the women collect from around their homes or, at times, far from the safety of their villages. Everyone from the women cooking their meals to international health experts—knows the smoke from the fires has a dark side. Most women say the smoke from 3-stone open fire irritates their eyes and blackens their pots and kitchen walls. Climatologists such as Veerabhadran Ramanathan, a professor at the University of California, notes that the black carbon (soot) from the smoke, which blankets the villages, contributes to anthropogenic climate change. Health experts report that smoke exposure increases the risk of numerous respiratory diseases. 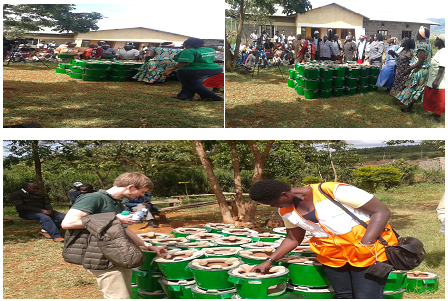 Last month Co2balance and World Vision Kenya launched distribution of energy efficient cook stoves in Nakuru and Baringo Counties in Kenya with a momentum for change. The launch is a testimony that action has started to take place. It’s factual that the use of efficient cook stoves can dramatically reduce fuel consumption, associated deforestation, carbon dioxide release as well as the social, economic and health impacts of collecting firewood and smoke related illnesses from traditional indoor cooking. Thus this is as an appropriate approach to helping the poor improve their lives, restore our ecosystems whilst at the same time adapting to climate change. The aim of this launch was to gather momentum, to gain momentum and to add momentum into the fight against climate change initiatives. Bringing community members on board from the onset has proved fruitful as it has helped understand the cooking needs of the people and the most social and cultural requirements that make a cook stove acceptable by people. This is a special moment for both co2balance and World Vision where we are looking at practical examples of how to reduce our emissions, adapt to climate change, overcome poverty and promote development, all at the same time from a local perspective. The project aims at delivering concrete results on climate change mitigation, with social, economic and health benefits. The event was a great success with community members and project participant’s alike, providing positive feedback on the experience, inspirations and lessons learnt from the launch. Leave No One Behind – World Water Day!